When Donald Trump blocks you on Twitter, does he violate the First Amendment? The Knight First Amendment Institute claims that when Donald Trump blocks Twitter followers who criticize him or his policies, he’s violating the First Amendment, and so Knight is suing on behalf of seven blocked tweeters to force the president to unblock them and open his Twitter feed to everyone. The relevant portion of the First Amendment states, “Congress shall make no law . . . abridging the freedom of speech.” The Supreme Court has interpreted that broadly to mean that federal, state, and local government governments may not restrict anyone’s speech. “Congress shall make no law” actually means “Congress may make some laws.” Courts routinely find obscenity, threats, incitement to violence, and fighting words to be unprotected speech. They also find some kinds of speech more protected than others: political speech, speech on matters of public concern, is the most privileged; your rant about the neighbor’s dog, not so much. It’s also constitutional to regulate the time, place, and manner of speech, so long as those regulations serve a legitimate government interest and do not discriminate on the basis of the speaker’s viewpoint. Loud, mocking, and rancorous civic dissent is protected, no matter whose side you’re on, but you can’t air your qualifications to serve on the school board from a loudspeaker atop an election van at full volume in the middle of the night in a residential neighborhood, and you can’t protest the war or anything else on the grounds or in the building of the Supreme Court. The Knight Institute contends that the president’s Twitter, @realDonaldTrump, is a government-sponsored public forum for political speech, and as such, access to it cannot be restricted only to those who agree with the government. Trump tweets to communicate policy, influence opinion, and solicit public comments. His followers regularly “like” the president’s tweets or complain there is no “dislike” button. They often reply to posts from the president’s account, indicating their support or opposition and offering their opinion. Or they forward Trump’s tweets, with or without comments, to their own followers. It has become routine for government agencies and officials at all levels to make announcements on social media; to warn of public dangers; and to communicate other important information. Like Trump, these government representatives use digital platforms to solicit input from concerned citizens (though unlike Trump, some of them actually listen to criticism). It has also become routine for Trump to block followers on Twitter, everyone from novelists like Steven King and Anne Rice to ordinary people you’ve never heard of. Knight argues that because Twitter, Facebook, and Instagram have “transformed community engagement,” because they have become our digital town halls and town criers, blocking some followers from @realDonaldTrump while permitting others to receive presidential updates and offer their feedback is a form of unconstitutional viewpoint discrimination. @realDonaldTrump is not just a presidential megaphone, it also invites feedback. As the screen shot below shows, Trump’s Twitter asks followers to “Tweet to Donald J. Trump” and provides a link to facilitate conversation. 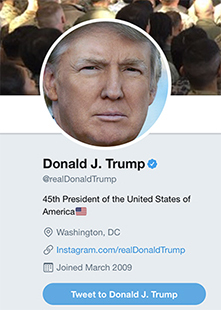 Blocking some followers not only prevents them from reading Trump tweets, it prevents members of the public from expressing dissent or discussing matters of public concern with the president, while offering access only to those who openly agree with him, or who mask their disapproval in order not to be blocked. Again, this is a way to discriminate against some speakers because of their point of view, and as such it chills political speech that should otherwise enjoy First Amendment protection. Above: Screen cap from @realDonaldTrump identifies Trump as president and invites readers to tweet to him. 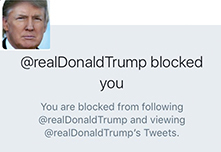 Below: Message that a user blocked by Donald Trump receives, as reproduced in the Knight Institute complaint. 1. This court has no authority to tell the president how to use Twitter. Translation: Your honor, the president or one of his predecessors appointed you, so shut up and listen. 2. The president can block whoever he wants, and because of the separation of powers doctrine, the courts have no power to stop him from exercising his discretionary authority to block a Twitter user. This is actually the doctrine of ius praesidis tantrum, the right of presidential tantrum. Like most legal terms, it sounds a lot better in Latin. 3. Trump’s Twitter is beyond the reach of the Constitution because his tweets are private speech, not an exercise of state power. The president has a secret that all of his 33 million followers can know, except for the handful that he blocks because they said mean things about him. 4. Trump could block anyone on Twitter even if he weren’t president. He’s going to block you next. 5. Even if the Twitter @realDonaldTrump was official government speech, blocking you does not abridge your speech, since you can still say anything you want as long as you don’t say it to Donald Trump. The public has no right to sue government officials for failing to follow the Constitution or obey the law. 6. The government is free to discriminate based on viewpoint. What you think doesn’t really matter, since you probably didn’t vote for him, though for the right price he could make an exception. 7. It’s not the president’s fault that Twitter allows followers to comment on a tweet. That’s on Twitter, not on Trump. We have to tell him every morning that there’s no way to disable the “Tweet to @realDonaldTrump” button. Nobody cares what you think. Even your mother doesn’t care what you think. Nyah nyah nyah nyah nyah. 9. The president’s Twitter is not a public forum. Just because it looks like a public forum, walks like a public forum, and quacks like a public forum, and other elected officials use their Twitters as public forums, @realDonaldTrump is not a public forum, so get over it. 10. Twitter makes the rules. Twitter allows users to block one another. Neither Trump nor the courts can tell Twitter what to do. Hey, Trump pays no taxes because the law allows him to. Trump blocks you because Twitter allows him to. He’d be crazy if he didn’t. Wait, what? There is no constitutional right to follow the president on Twitter. Trump has freedom to speak but you don’t have freedom to listen. I am Vladimir Putin, and I approve this message. If the court sides with the Knight Institute, it will order Trump to unblock everyone he’s blocked and to stop blocking anyone else, in which case Trump might just decide to abandon Twitter (though more likely, he’ll just throw another ius praesidis tantrum in the West Wing). If it accepts the Justice Department’s arguments, Donald Trump will go on blocking Americans until there is no one left to listen. Then he’ll tweet that he has more followers than any world leader anywhere, ever, and there will be no one left to dispute him.